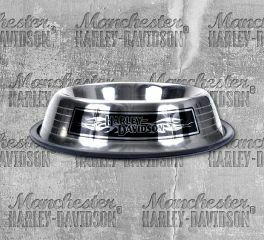 The Harley-Davidson® logo is proudly displayed on these durable, stainless steel dog bowl. Designed for function and appeal, these bowls have a skid-proof rubber bottom and polished finish for long-lasting beauty, and is 32 oz. capacity. Rope toys ensure hours of tug and toss fun. The rugged ropes also help keep gums and teeth clean and healthy. Constructed for loads of doggie attention! 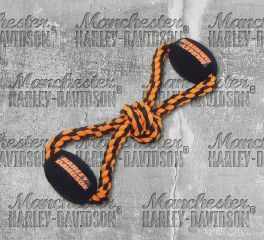 Harley-Davidson® Canvas Flying Disk with B&S® & Wings Orange Pet Toy is great for dogs that love to play fetch and have a tugging good time. With a combination of canvas and rope, this 16.5" flyer features Harley wing grips making it easy to throw and catch. This dog toy is sure to provide hours of fun and interactive playtime. Ideal for everyday use. Pet must be supervised while playing with toys. If toy becomes damaged, discard immediately. Don't let your dog go nameless into that dark night. 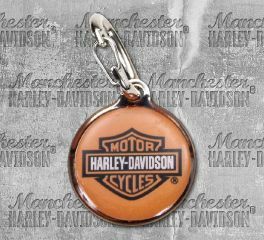 The Harley-Davidson® Bar & Shield® Instant Pet ID Tag is a great and stylish way to keep your dog identified. 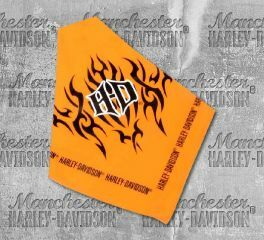 The 1" tag has a classic Bar & Shield® emblem over with an iridescent orange background. The back is ready for instant identification, just write your information and apply the included adhesive LEXAN™ seal to create a waterproof tag. An added bonus of this I.D. tag is the EZ Change™ clip making changing collars a breeze. Coastal Pets. 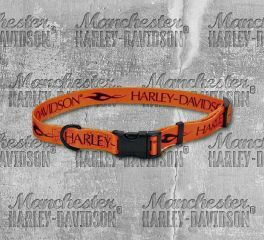 Harley-Davidson® Abstract Flame Adjustable Pet Collar is perfect for your growing pet. 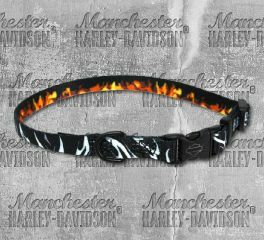 This adjustable collar features outstanding, colorfast flame graphics that have been beautifully printed on both sides. The snap-lock buckle on this nylon collar is contoured to fit your pets' neck more comfortably. 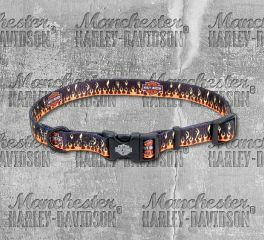 Harley-Davidson® Bar & Shield® Abstract Flames Adjustable Pet Collar is perfect for your growing pet. 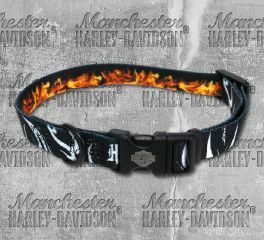 This adjustable collar features outstanding, colorfast flame graphics that have been beautifully printed on both sides. The snap-lock buckle on this nylon collar is contoured to fit your pets' neck more comfortably. 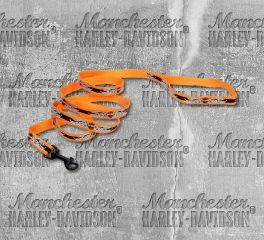 Harley-Davidson® 4 Feet Flames Bar & Shield® Nylon Leash is made of nylon for your pups that was born to ride. This 1" Wide, and 4 feet long leash features a flame design and Bar&Shield® logo printed on both sides, and swiveling snaps to prevent tangles. 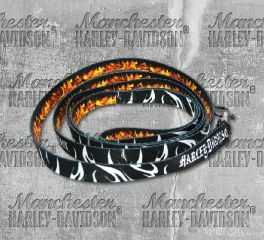 Harley-Davidson® 6 Feet Abstract Flames Sublimated Pet Dog Leash is made of nylon for your pups that was born to ride. 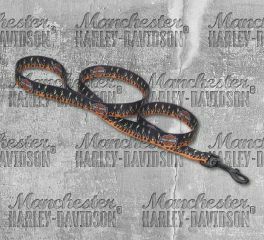 This 5/8" wide and 6 feet long leash features an abstract flame design and Harley-Davidson® script printed on both sides, and swiveling snaps to prevent tangles. 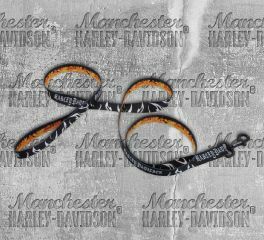 Harley-Davidson® 6 Foot Abstract Flames Black & Orange Pet Dog Leash is made of nylon for your pups that was born to ride. This 6 feet leash has abstract flames printed on both sides in two different flame patterns and swiveling snaps to prevent tangles.